Pop Up Pizza is serving up amazing pizza in 89103. Located in downtown Las Vegas in the newly remodeled Plaza Hotel, our signature pizzas are made with only the freshest ingredients. Our hand made pizzas are always crowd pleasers from traditional mozzarella pies and Chicago pepperoni pies, to pies like The Goodman, made with mozzarella, caramelized onions, mushrooms, spinach, and red potatoes, or The Newport, made with ricotta cheese, roasted artichoke, peppers, eggplant, spinach and mushrooms. Yum! Build your own pizza from our list of ingredients. Start with a home made gluten free dough, home made sauce and your choice of gourmet cheeses – including vegan cheese. Pile on any toppings you want, from artichokes to pepperoni! 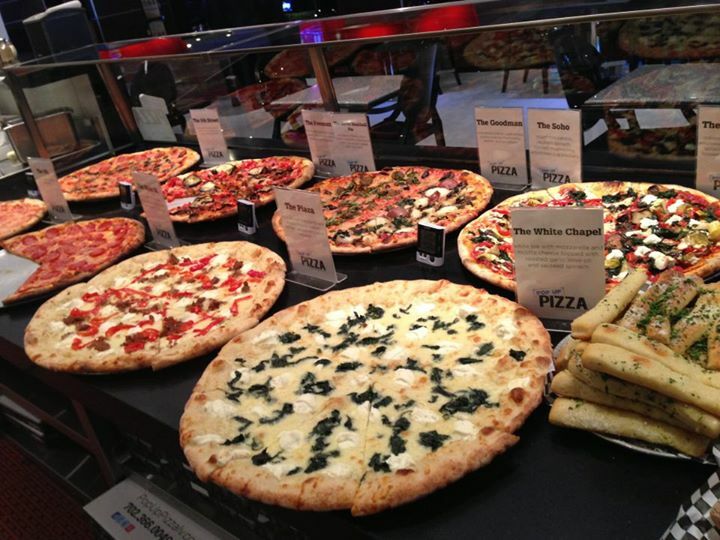 We also serve pizza by the slice, and when you buy 9 slices, the 10th is free! Pop Up Pizza isn’t limited to just our delicious pizzas. Our menu includes fresh garden and Caesar salads, classic bar foods like chicken fingers, wings, garlic fries, and mozzarella sticks, vegan soft serve chocolate and vanilla ice cream, and a choice of alcoholic and nonalcoholic beverages. We also offer pizza delivery in Las Vegas – Call (702) 366-0049 to order, or place your order online. Don’t forget to ask about our current specials!